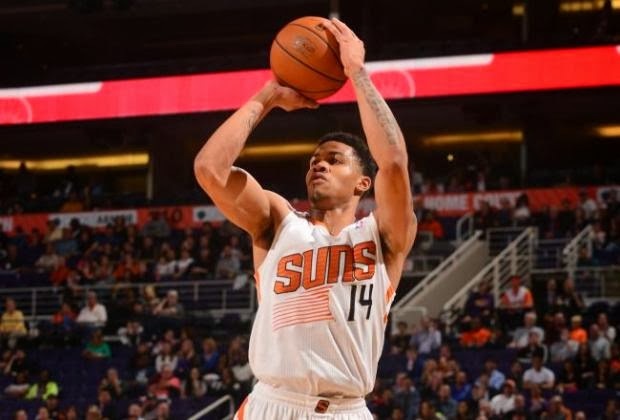 Gerald Green joined the Phoenix Suns this offseason, his 7th NBA team since being drafted in 2005. The Boston Celtics drafted him 18th overall out of Gulf Shores Academy in Houston Texas and 113 games later, was traded to the Minnesota Timberwolves in the Al Jefferson deal. After just 29 games with the T'Wolves, Green was traded to the Houston Rockets, only to be waived 4 minutes, and 1 game later. Staying in Texas, Gerald Green signed a contract with the Dallas Mavericks and after 38 games played, Green would not play in the NBA again until the 2011-12 season, when the New Jersey Nets signed him to two 10-day contracts, and eventually for the rest of the season. Green would appear in 31 productive games for the Nets, averaging 13 points per game, which landed him a contract with the Indiana Pacers. Green would appear in 60 game for Indy, before being traded, once again, this time to the Phoenix Suns, along with Miles Plumlee AND a 1st round pick, for Luis Scola. Easy to say, the Suns robbed the Pacers. It looks like Phoenix will be where Green finally sticks long term. Green is starting for the Suns in their back court alongside Goran Dragic and is getting 29 minutes a game. This is by far his most productive season in the NBA and is averaging 15.2 points, 3.5 rebounds and 1.6 assists, while shooting 44% from the field as well as 38% from behind the arch. The three ball is the biggest improvement in Greens game. He came into the league as a dunker, somebody who just loves the fastbreak so he can give the fans a show and that's really it. Now Green has a beautiful jump shot, and is hitting 2.5 3's a night. However don't be fooled, if you don't play smart defense on him from the outside, he'll still blow by you and put you on a poster with a ridiculous dunk. When Green gets hot, there is almost no slowing him down. Green has 9 games this year when he has made five or more 3 pointers. Most recently was his matchup with the Oaklahoma City Thunder when he led the Suns past Kevin Durant and Russell Westbrook and put on a show. Green had a career high with 41 points as he was 12-22 from the field, 8-13 from downtown and 9-11 from the charity stripe, his 7th game since January with 25 or more points. At just 28 and not a whole lot of wear and tear on his body, I think the Suns will keep Gerald Green long term this time around.